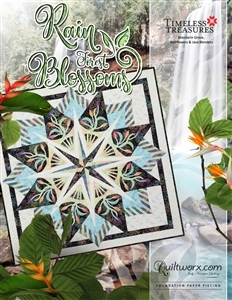 This package includes newsprint and applique to make an additional sample if you already have the instructions. 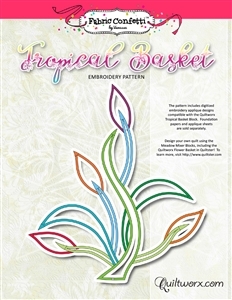 This pattern includes digitized embroidery applique designs compatible with the Quiltworx Tropical Basket Block. Foundation papers and applique sheets are sold separately. The download contains machine embroidery designs in the following formats: .art, .art60, .dst, .exp, .hus, .jef, .pes, .shv, .vip, and .vp3. SVG and PDF Cutting Files included. There are also instructions for preparing Applique circles using the Stitch-N-Peel Templates. Design was completed by Vanessa Fromm from Fabric Confetti.